For 18 years, Bogotá, Colombia, has shown that a large city can survive without cars. In 2000, Mayor Enrique Peñalosa—currently in his second term—implemented Car-free Day. This initiative, which residents approved by referendum, takes place on the first Thursday of February each year and is a day without cars and motorbikes: the circulation of all motorized vehicles is prohibited from 5:00 am to 7:30 pm. On this year’s Car-free Day, 1.6 million cars and 500,000 motorbikes (11 percent and 7 percent of regular trips, respectively) remained at home. 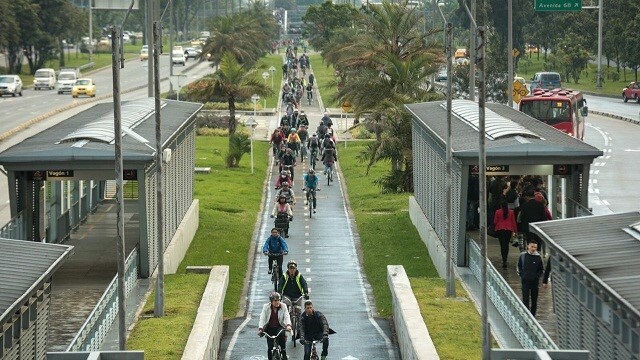 To accommodate travel-as-usual, the city designated and extra 100 km (62 miles) of temporary bike lanes, adding to the current 400 km (250 miles), and encouraged residents to utilize Transmilenio, the city’s bus rapid transit system (BRT). Largely as a result of the expanded cycling system, estimates show that cyclists more than doubled on Car-free Day, jumping from 700,000 daily riders to over 1.5 million. 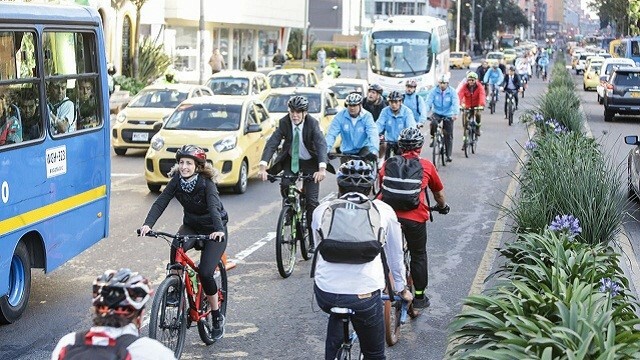 82 percent of Bogotá’s residents experience no behavior change on Car-free Day—they already travel the city without private, motorized transport. Despite no personal change, there is a noticeable difference in the city: less congestion, less air pollution and a sharp drop in the number of traffic crashes. But there is also a downside to Car-free Day. Although the city encouraged using Transmilenio, the system had difficulties during peak times. Transmilenio, also launched in 2000, was crowded and delayed. As in recent years, some business owners have complained that the sales decreased and there was criticism over the aggressive behavior of cyclists. “The most important thing that this journey has forced us to discuss is, again, which model of city is more sustainable—a car-oriented one or a city where people walk, cycle and use public transport,” said Dario Hidalgo, Director of Integrated Transport at WRI Ross Center for Sustainable Cities, born in Bogotá. In 2000, when the Car-free Day referendum was held, the population also voted on another proposal: to prohibit the use of private vehicles in the city by January 2015, a transformative shift that would require important investments in public transport and infrastructure for bicycles and pedestrians. Despite having a positive majority, the total number of votes was not sufficient for this more “radical” change to become a law. As a result, only Car-free Day was instituted, and it can only be reversed by another referendum. Lessons from Bogotá can be shared with other cities. With Car-free Day reaching maturity, it is possible to see how the proposal has changed the urban mobility discussion and affected people’s behavior, benefiting the wide majority of inhabitants who don’t use private vehicles on a daily basis. Stimulating mobility behavioral changes is a great way to propose a transformative shift—as long as the changes are defined by and benefit the majority.